Hi, we require an icon and banner created for our Shopify app. To be clear we require all files (not just the exports) and rights associated with the design to be handed over when the winner is chosen. The App icon should be 1200 x 1200. The Featured App Banner should be 1600 x 900. I want the design for the banner to be a soft painted type version of our order history output. I’ve attached another design from a different app (the one that say IMPORT/$180 in it) to show you what I mean. Look at the picture on the left, it looks like a simplified soft painted version of a web browser window. 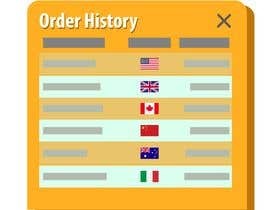 I would like that sort of design of our order history image I’ve attached (or follow the link). Also there should be the title and additional text somewhere in the banner. It will be up to your discretion on what you think looks good on where this text would be placed. Maybe both title and additional text at the top, and order history design below it, maybe title at the top, additional text at the bottom, and order history design in the middle, or both texts at the bottom and order history design above it. Like I said it’s up to your discretion. Additional text: Just like ebay! When writing eBay, use your discretion on what you think looks best for font, colour, and capitalisation. It could be “ebay” or “eBay”, the text could be the ebay colours or just one colour. I’ve attached a few examples of other designs, but use your own discretion of what looks good for your design. Lastly the icon is up to your imagination, and may be different from the banner design. However I think a smaller version of the order history soft painted design could work here. But if you can think of a good icon design related to the order history, give it a go. Does your Brand have a logo, that person can include ? In the 3rd column put random numbers, keeping them on the low end and mostly 1’s, for example 1,1,3,2,3,1,4,2,5 etc..